Almonacid takes us several miles south of Aranjuez. The French under Soult and Joseph moved to cross the Rio Tajo at Toldeo, the Spanish Army of the Centre under Venegas followed suit and formed up at Almonacid de Toldeo. The Spanish have the 1st to 5th Divisions – generally each with two infantry units, one artillery and perhaps some cavalry. 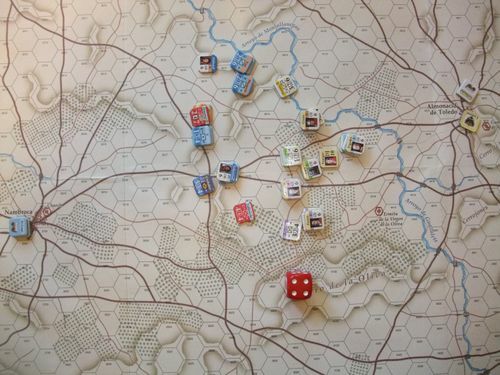 The French have Sebastiani’s IV Corps and Milhaud’s 3rd Cavalry, both forward approaching Almonacid , and Joseph and Soult with the Guard approaching from Toledo. The Poles in Toledo are the garrison and must stay there. The terrain is generally rolling hills and olive groves. In front of Almonacid is a stream, with a couple of hills to the south of the town. The Spanish have no helpful terrain feature to anchor their flanks on. The French started the Day of Battle with Sebastian’s forces delayed (moved back one move) and Soult and Joseph ‘asleep’. Sebastian moved up to the stream, but then waited. Milhaud’s cavalry crossed the stream to the south and occupied Villaminaya. 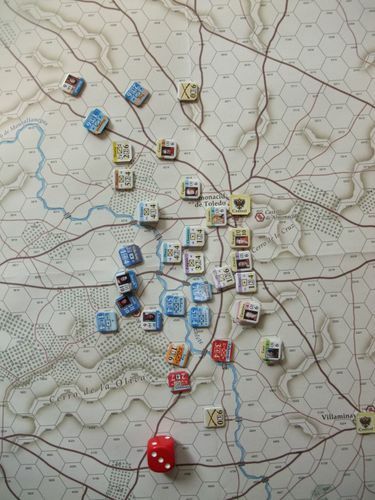 To meet this threat Venegas pulled Lacy’s 1st Division south, deploying it to the east of Giron’s 3rd Division, with the divisional cavalry extending the line east. At 10am Sebastian moved and attacked the Spanish on the Cerojones Hill. The French initial attack was thrown back, a second attack threw the Spanish 1st Divisions back and routed the 3rd. Venegas pulled Zerain’s 5th Division south and was pleased to see the 6th and 7th Divisions arrive from the east. As a dust storm enveloped the battlefield the French cavalry routed the Spanish, swept to the east of Almonacid , capturing Castejon and ignoring the approaching Spanish reinforcements swept into the rear of the 1, 4 and 5th Spanish, routing them in the space of half an hour. The rest of the battle is quickly told; the 6th and 7th Spanish Divisions were overran as they tried to escape to the east and the 2nd Spanish died heroically as a rear guard. It is easier to say who survived – two rallied infantry brigades – the rest of the Spanish were scattered to the four winds. With 49 Spanish SP lost for no French – not even one French unit reduced by a shock combat - it was an overwhelming French Strategic Victory. 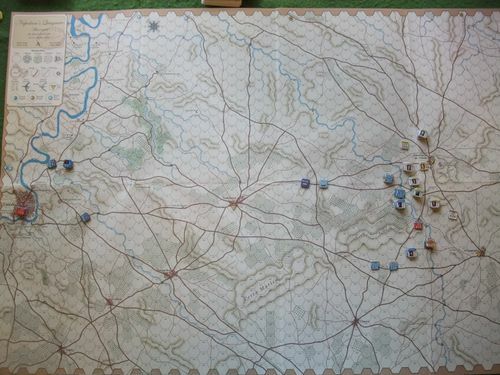 I decided to try the Approach to Battle as the mini-campaign from Aranjuez. The French had lost three Polish infantry units and had Guye of the Guard reduced. The Spanish had six infantry units reduced, at least one from each Division. Both sides start on opposite ends of the map, with only Zerain’s 5th Division holding Almonacid . I decided as Toledo needed a garrison, which had been the now deceased Poles, the French had to leave the same number of SP there. That accounted for the French 3rd Division. The Spanish marching from Aranjuez moved rapidly, by noon as IV Corps cavalry approached only the 2nd Spanish Division was still arriving. 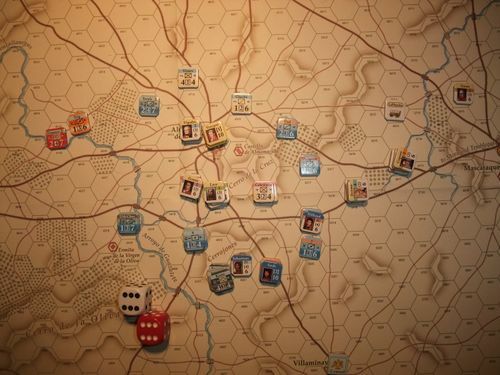 Sebastiani and Milhaud deployed along the line of the Aranjuez – Chueca road with the cavalry to the north and at 4pm saw to their surprise the Spanish attacking! Almonacid – 4pm – Mon Dieu; they are attacking! To the north Milhaud acted, routing the unit from the Spanish cavalry Corps. He was then encircled and was very lucky to drive off the attacks from the Spanish 3rd Division. In the centre the French 1st Division was pushed back and Sulkowski’s Poles surrounded, fighting off the initial Spanish attacks but finally being broken. The Spanish 3rd Divisions pushed too far forward and were routed, to the north the French and Spanish cavalry lost a unit each. As night fell the French fell back to Nambroca; they had received a bloody nose and got off better than they could have [two lucky ‘Attacker retreat’ results for crucial Spanish attacks that would have eliminated French units]. With reinforcements coming (although delayed by confusing orders) did not want to risk a worse defeat. 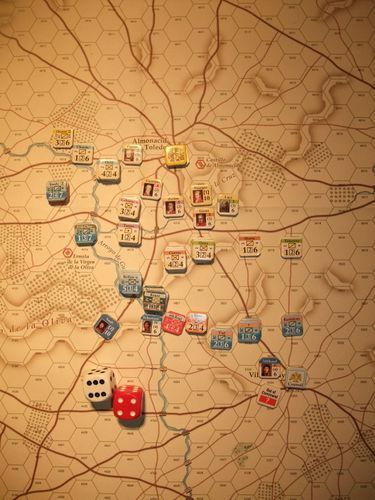 Losses were 7 French SP and 15 Spanish; but as the Spanish held the key positions of Almonacid and Villaminaya they were ahead on VPS – 8 to 3. Next day Venegas decided Spanish honour was satisfied. Rallying his troops he declared General Retreat and retired to fight another day. Sebastiani and Milhaud waited for the Guard to arrive before advancng and so were too far behind to catch the Spanish. Adding up the Aranjuez and Almonacid battles the French had lost 15 SP, the Spanish 10 SP; at Aranjuez the Spanish held all the VP locations at end; at Almonacid the French did the same. 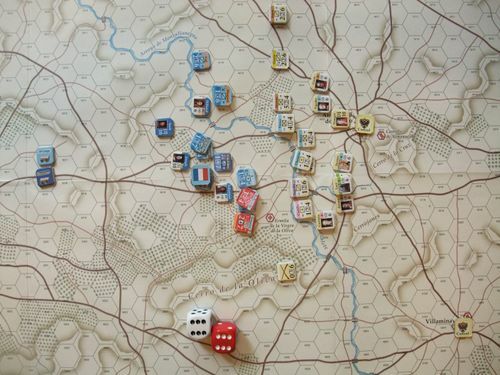 Adding all up with the cards it came to 0:2 in favour of the Spanish – a Spanish Tactical Victory, the French held and the Spanish Army saved. But what if the Spanish had stood and fought? Well, in fact I did not play out the Spanish retirement (as the result was obvious) so having left the units in place I slid down the other leg of the Trousers of Time ….. The French waited until Joseph, Soult and the Guard arrived and then advanced, cavalry on either flank. The Spanish waited behind the stream, having been joined by some guerrillas. The first French attacks were pushed back, but Spanish counter-attacks were also repulsed. At 3pm Milhaud’s cavalry swing wide round the Spanish right flank, while the infantry crossed the stream to the south. In hard fighting the French were pushed back. Almonacid – 3pm The moment before disaster; note how there are no Spanish combat units between Vial’s cavalry and Almonacid. At 4pm Vial’s cavalry brigade swept through the unguarded Spanish rear, capturing Giran and scattering leaders far and wide. To the south the Polish cavalry of IV Corps did the same. With the cavalry to their rear and French infantry to their front 1, 2, 3 and 6 Divisions broke and ran. The rest was mopping up, although Guye from the French Guard was eliminated in a sudden burst of Spanish resistance. As the dust settled the French had lost 11 SP, the Spanish 55 SP with every division demoralised. Adding up the two days it was 35:0 VP to the French and a Strategic Victory. Ouch! A bit of a Spanish nightmare, nothing to protect your flanks and roving French cavalry just waiting to push round them. Now to Ocana, where there is at least a Spanish cavalry corps. A very good AAR...The next game to my bag will be this. The shame, the shame - spelling now corrected. Carlos - As a Spaniard how do you feel about the way the Spanish army is portrayed in 'Quagmire'? Historical or too weak?